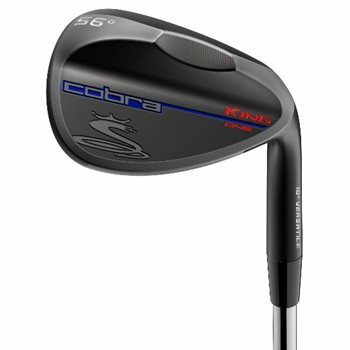 The Cobra King Black One wedge matches 7-iron length and weighting to deliver maximum simplicity and consistency to your wedge game. The wedge features Progressive Spin Technology to provide more consistent trajectory through wedge lofts and a muscle back construction to dampen vibration for improved sound and a softer, yet more solid feel at impact. The 100% CNC milled face and grooves provide consistent spin across the entire face and optimized roughness to maximize spin and control for more precision shots around the green. Track your improvements with Cobra Connect Technology which uses a seamless in-grip electronic sensor to provide detailed stats and analysis. The new Dimonized Black Metal satin finish provides extreme resistance to wear for longer lasting, better looking wedges. The Versatile grind design features toe, heel and trailing edge relief. Review by Ken, 3 months ago.